--from a typically brilliant analysis of the national mood in America, published in the current Economist. The pub keeps impressing us with its stately, sophisticated brilliance, solid writing and reporting and things we just don't find anywhere else. We've enthused over the magazine before (here, here, here, here and here) and will no doubt do so again. I can think of several American pubs that could benefit from studying The Economist with an eye toward making some improvements themselves. (special thanks to our friend Richard A. for sending this along. We think it requires no comment from us. If you're having trouble reading the fine print on the bus, just click on the image for a larger version). For decades, professional sports franchises chose players solely, or at least primarily, by their raw talent. If you could hit, pitch, run, tackle or dunk better than everyone else, that was generally enough. In more recent years, successful owners, general managers and coaches have learned that it takes more--that character counts too (the San Antonio Spurs come to mind in this context). Some players are cancers in the clubhouse, and it can't help but spread to the rest of the team. I thought of all that last night as I scanned ESPN.com (not too surprisingly, my teenage sons have set this as the default browser on our home computer) and read this interesting update on the Manny Ramirez situation by the veteran sportswriter Peter Gammons. He rightfully lays into baseball's leading prima donna (who spent his formative years in Cleveland), concluding with this: "buyer beware of a man who chooses to be judged by numbers and salary, with no regard for character or integrity." Amen, we say. If you care to dig more deeply into this story, the New Yorker ran this excellent profile of "mystery man" Ramirez last year. It serves as a nice companion piece to Gammons' column. UPDATE: The Boston Globe glumly reports that "Manny Mania" is sweeping L.A.
With the economy heading into a nosedive, possibly a long one based on some structural reasons we'll get to later, we're probably entering a period in which reduced expectations will be the norm for some time. All manner of ambitious building projects--whether it involves building organizations, physical structures or other something else--will have to be scaled back, either because of tighter credit, slower cash flow or some other form of crimped financing. We think the answer is simple: collaboration. But the trick is choosing the right collaborators, of course. If even such hallowed, deep-pocketed institutions as the Washington Post and Harvard will be in an austerity mode--at least relative to recent boom times--why not team up, as they're doing here. We also like this collaboration between the New York Times and the booming social networking site Linkedin. In coming weeks and months, we'll be on the lookout for similarly interesting collaborations. But we'd also love to hear about some of your favorites. Not long ago, I mentioned the newly reopened CMA (the most expensive cultural project ever in Ohio), and how I'm looking forward to checking it out. I haven't quite managed to get there yet, though hope to very soon. In the meantime, we can all begin getting a sense of it from the fruits of Jim Fisher's blog photography. Nicely done, Jim. And thanks for the recent tour of Ideastar. Your team members are wonderful. --from a thought-provoking cover story in the current issue of The New Republic, by Alan Ehrenhalt, the long-time editor and now publisher of the excellent Governing Magazine, which recently published an article on similar demographic trends in Atlanta. As long as you're over at Governing, you might as well also read this great piece on the prosecution of public corruption cases, an especially charged topic after the Bush-Rove attempts to corrupt that process. Newest Import. Not long ago, we noted the apparent importation of the horribly mis-named ritual called "honor killings." Now, we seem to be importing soccer hooliganism from England. What's next--female genital mutilation? 'Swept With a Wave of Nostalgia and Longing.' My friend Maria Stewart experiences a wave of nostalgia for her former students. This will sound quite familiar to anyone who's taught and/or mentored folks over a long period. The only difference: most people can't articulate these feelings quite as well as Maria. Earlier, we brought you her excellent eyewitness report on the Nieman narrative writing conference. Nudie Foodies. Sorry, we couldn't help ourselves. Please, people: at least bring a towel to sit on! Is NorTech a Goner? Here's one more sign that the region's technology council, NorTech, may be on its way to being retired soon. It's once-ballyhooed website for gathering all the tech job openings in one place has been folded into the state of Ohio's general online job site, where the tech jobs will be all but lost in a sea of too many jobs and three million online resumes. That seems like a fairly obvious indicator of what lies ahead. --David Letterman last night on his show, outlining the reasoning behind why Yankees' star Alex Rodriguez would be a good choice for vice president. You can review earlier Letterman mentions here. Madonna and A Rod, on the other hand, are virginal subject for us, if not for each other. We apologize for this exceedingly rare descent into the idiot culture, but hell, it's summertime, and we couldn't help ourselves. We now return you to our usual highbrow (or at least middlebrow) material. --from an article in The New Republic about an election simulator that keeps pointing to the two Midwestern football rivals as the decisive battleground states in the upcoming presidential election. Earlier, we brought you this electoral map of the potential battleground states and this roundup of stories looking at Ohio's place in the race. Vanity Fair has some fun with the recent flap over its sister publication's cover image on the Obamas. In 1991, VF prompted a controvery of this approximate magnitude, when then-editor Tina Brown put a naked and pregnant Demi Moore on the cover. That image has since become iconic, as will the Obama cartoon, which we loved, by the way. 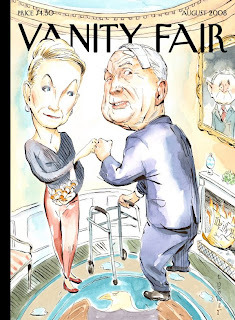 We think all those irony- and humor-challenged scolds who thought the New Yorker's image unfair need to chill out and get a life. That begins with the oh-so-serious Obama circle, which takes their guy way too seriously, and seems to be doubling its level of hubris almost daily. You know what happens when that sets in, don't you? Did you know that an entire body of pseudoscience has arisen around the issue of which side of the head one parts their hair? Fortune Magazine reports that a disproportionate number of CEOs in corporate America choose to part on the left side. Even more intriguing: after she dropped her historic run for the presidency, Hillary Clinton changed the part in her hair from the left side to the right. We look forward to your reactions to this ground-breaking new research. This is no longer a subject most people can take for granted, is it? Meanwhile, we're beginning to hunger for a Mini Cooper to go along with that Vespa. With a Nice Salute by Barber, Roldo & Co. This week's issue of the Cleveland alternative weekly the Free Times was its last. As we noted a few weeks ago, a Pennsylvania-based publisher has bought both of the town's alt-weeklies, and will combine them, beginning next week, into a single paper, to be called Scene. We liked the classy send-off the FT gave itself, by asking veterans of the weekly to recall what it all meant. You'll find them all here. In the lead piece, our friend and long-time comrade Cindy Barber, once the editor of the paper and now co-owner of the hipster heaven, the Beachland Ballroom, tells a lively story about the old days, and nicely sets the scene for what will follow (we've mentioned Cindy earlier, here, here and here). Some more good news about the merger: we hear the online archives of both papers will remain available. Even Cartoons Try to Achieve Racial Balance. A couple of months ago, we told you about a new Fox cartoon spin-off, which was expected to be called Cleveland. Variety reports this week that the show--whose name has now apparently grown to The Cleveland Show--has found a way to balance the racial make-up of the cast, by including a red-neck white neighbor. As we said earlier, it all sounds just a little like a latter-day cartoon revival of All in the Family. Another Online Tool for Tracking Political Giving. Ariana Huffington's Huffingtonpost continues to tinker with new additions to the site. One of the latest is this helpful database of political giving. Over the years, various forms of this tool have been made available to the public. The Federal Elections Commission, keeper of the underlying data, debuted its own online database some years ago, but it wasn't terribly user-friendly (I haven't tried it lately, but will now). The best of these tools has been the one supplied by the Center for Responsive Politics, a foundation-sponsored nonprofit founded by a former ABC investigative producer. It was a far superior tool, because it included some massaging and interpretation of the numbers. Professionals in media, politics and fundraising have been using that gateway for years, but I think the new HuffPost search engine will introduce this process to a much wider audience, which is good for political transparency. Finally, Speaking of Fox: we liked how Vanity Fair recently turned the tables on idiot culture stalwart Fox News. Nicely done. --from a sublimely written book review in the current issue of New York Magazine, by a writer I'd never previously encountered. He goes on in the piece to write brilliant riffs like this one: "Good popular history requires a paradoxical skill set: on one hand, the centrifugal instinct to roam widely for obscure details that would otherwise rot, neglected, in far corners of the archives; on the other, a centripetal impulse to radically compress those rescued details for an audience that might well have forgotten the basic outlines of WWII. Pop histories must be simultaneously comprehensive and concise, expansive and abridged, deep and shallow." You can review earlier best leads (lead paragraphs, that is) here. --D.H. Lawrence. In honor of my only sister, who'll marry Ben this weekend, we pulled out this golden oldie from DHL. No sentiment seemed quite so right for the occasion as this one, and so we decided to use it again, three years after we first put it to use. Congratulations, guys. Just when you think the impending presidential election will finally prevent the Bush White house from starting any new hostilities shortly before the scheduled regime change in the U.S., a veteran reporter named Sy Hersh tears back the curtain again on what is perhaps history's most secretive American administration and shows the unpleasant realities at the heart of the corrupt Cheney co-presidency. The Veep and his henchmen continue to collectively motor on in their path of destruction right down to the last hour, as if it were one big cyborg sent from a future century to kill everything in its path. In recent weeks, we witnessed far too much obligatory praise of the late Tim Russert and his supposedly fine, aggressive journalism. But I ask you--did official Washington really hold him close to its bosom and elevate him to a pedestal because he was adept at digging into its dirty laundry and challenging its basic assumptions as a member of the Fourth Estate, or because he subtly served as a megaphone for the conventional wisdom? Since Russert's death, many have observed that the most serious kinds of journalists inspire not admiration so much as fear in their subjects. 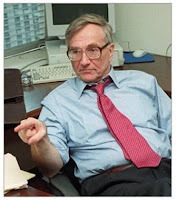 Sy Hersh is of course one of those kinds of reporters, and he has been for 40 years (since he broke the news of the My Lai massacre during the Vietnam war, earning a Pulitzer prize in the process). This past week, he was at it again, breaking the news of secret Congressional approval of a new pot of money with which the White House can make trouble in Iran, possibly touching off a reaction that could be used as a pretext to make war on one more Middle Eastern nation. This splendid interview he did with Terri Gross on NPR's Fresh Air is a nice companion piece to the article. I hope you'll closely read and listen to them both when you have the time. We've mentioned Sy Hersh several times in the past. We've perhaps implied it before, but let us be more explicit now: Seymour Hersh is a national treasure. Is Peace Corps Missing the Mark? A Peace Corps alum argues in this article from Foreign Policy magazine that our country's signature citizen-ambassadorial program isn't all it's cracked up to be anymore. I'll be interested to run this by my handful of friends and extended family members who have served in the corps, and thus will no doubt have their own opinion. Oh great... "Honor killings" have now been imported to America. Let's hope this is merely an isolated instance and not the beginning of a trend. Sad to See What WWII Bombs Obliterated. The Guardian publishes this cache of haunting photos of German cities, shortly before they were mutilated by Allied bombs. The photos were recently discovered, and apparently never before published. Who says there's nothing new to learn about a war that happened over a half-century ago? We lunched recently with our friend Chris, a superscribe with the vaunted international consuling firm McKinsey & Co., and he regaled us in the usual fashion with stories of his exploits. We know some fast-brained folks, but he's right near the top in the neural circuitry department, and the occasional catch-up chats are never long enough to capture half of what we'd like to discuss, but of course that only renders it that much more interesting the next time. Still, we do our best by racing through dozens of subjects of mutual interest. But I often walk away from these lunches chuckling over one special nugget of information, a joke, observation about the news, or some other detail. This time it was a bit of office humor he shared. 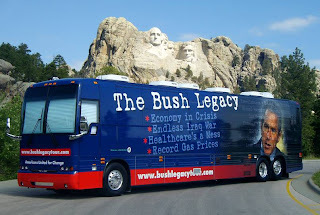 Referring to the fast pace of work and constant travel in the company, and the need to squeeze personal vacations into business travel plans, he said the term they use for adding personal time to business travel is "leveraged flyouts," a take-off on leveraged buyouts, or purchases of companies with the use of lots of debt. Anyway, it made me laugh. We've mentioned Chris once before, by the way, in this account of his observations of China. And I also referred to a touching story he once shared about his then-infant son's reaction to his parting, in this dad's column. This month, the honor goes to Kafka Come to America: Fighting for Justice in the War on Terror - A Public Defender's Inside Account. If there are still any doubters about how Kafkaesque things have gotten in this country, they've only to thumb through any halfway decent newspaper (alas, a list that's fast dwindling). Honorable mention goes to Barbara Ehrenreich's latest, This Land is Their Land: Notes from a Divided Nation (the jacket cover has the word "our" crossed out and written over with the word "their"). You can review earlier favorite book titles here. --Cleveland-based urban development guru Ned Hill, while being interviewed recently on Smart City Radio. We recommend you listen to the whole thing, because it's full of insight and aha! moments, and serves as a vivid reminder of why Ned has a national reputation. While you're at it, you might also give a listen to this equally stimulating SCR interview with writer Alex Kotlowitz, who expands on his Fast Company article about Chicago, which we recently noted here. In the interview, Alex admits to being an eternal optimist by the very nature of his work. "The very act of writing is an act of hope," he says. He won't get an argument from us on that. Two years ago this month, I noted an eye-opening Wall Street Journal article about the two young founders of Google and their emerging plans to outfit a personal jet for wild parties. It gave people the idea that perhaps these two were about to take their eye off the ball a bit, with possible bad consequences for the web search giant. That doesn't seem to have happened. But this weekend, New York Times business columnist Joe Nocera wrote a great piece about Google's coming to terms with the fact that lots of its employees need on-site day care. The piece reads like a study in corporate hubris, and raises the possibility that this mighty company just might be headed for a major stumble as a result of its insularity and extreme pride. Our Favorite Headline of the Week. Okay, you might find this headline in Ad Age silly, but we think it makes it pretty hard for a reader to pass up the article. Prediction: The Next President Will be a Lefty. Well, not that kind of lefty necessarily. A Not-to-be-Missed Event. Don't forget to check out the Cain Park summer art festival in Cleveland Heights next weekend. Apart from the Feast of the Assumption in Little Italy, it's the high point of Cleveland's summer fests, I think. Always a Step Behind. In 2002, shortly after the first Internet-fueled tech bubble burst, I read in the New York Times about Pittsburgh's Carnegie-Mellon University opening a satellite campus in California's Silicon Valley. I recall having two immediate reactions: one, that's a smart move, and secondly, why isn't our own Case Western Reserve University ever doing that kind of forward thinking? The two schools are roughly compatible in size and resources, just as their host cities are. The only difference, I'm afraid, is the quality of leadership in the universities. But good leadership never stands still, naturally. Sure enough, take a look at this page, which documents how those satellite CMU campuses have now spread around the world. Read it and weep, Case. Be careful around those fireworks today, folks. We wouldn't want you to be added to these numbers from the CDC. But do enjoy the Fourth, will you? 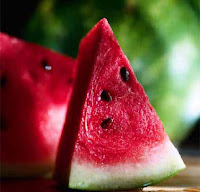 We predict massive shortages of watermelon all around the world, with unprecedented levels of hoarding, and even scattered reports of hospitalizations, due to overeating. Why, you ask? You read it here. I'd call it a tossup at the moment. They're both mostly in meltdown mode. The only difference, perhaps, is that the newspaper industry business model has been eroding at a sickeningly fast pace in the last year or two, while American automakers have been on a slow, steady descent for about a quarter-century now. I remember going to Detroit in about 1990 to profile a senior manager of General Motors, and the thrust of the piece was about how the industry (which then called itself the Big Three) had seemingly hit rock bottom. Looking back 18 years later, I'm sure that would have seemed like, if not the golden era for GM and its domestic competitors, at least a pretty healthy point, relative to today. A tip of the cap to my friend Doug Fisher, whose marvelous Common Sense blog is worth exploring when you have some time. You'll find plenty of insight from a seasoned journalism pro, and I'm honored to have a link from that blog to this one. Sinking to Where She Belongs. The egregious Judith Miller, who helped get the U.S. into its worst foreign fiasco in at least a century by serving as a credulous stenographer for the Bush Administration while supposedly reporting for the New York Times, keeps sinking ever lower on the journalism food chain. Now she's in the pages of Reader's Digest. It doesn't get much lower than that, folks. The old joke in the magazine industry is that RD's circulation would be only half as large as it is but for the fact that millions of widowed spouses never quite get around to cancelling their late partners' subscriptions. College Prowler's On the Prowl at CIM. A couple of years ago, I wrote briefly about an interesting book publisher that packages and sells college guides, but with a twist: they're written by current students of the institution. According to this ad on Craigslist, now that company, College Prowler, is on the prowl for a student at the Cleveland Institute of Music to write one about CIM. There's only one problem: the gig pays a cool...$100. Yes, $100 to write an entire book. And if you believe it'll only take 50 hours, as the ad indicates, then you're probably still waiting for the tooth fairy to show up in person. Anyway, I'd say that belongs in the chutzpah file. The PD has a new Real Estate Blog. Haven't sampled this yet, but I plan to. If you have any early opinions about it, do please let us know. Best Headline of the Week. The Jerusalem Post adorns a story about Obama with the headline"Oy-bama!" Meanwhile, far less funny is the fact that the paper reserves an entire section for what it calls "The Iranian Threat." Perhaps it's secretly edited by American neoconservatives who have been trying their level best to pick a fight with Iran. Finally, on a Lighter Note...We bring you news of this sublimely inspired subject for a summer college seminar: the intersection of fly fishing and literature. Take a bow, CWRU. You too, Orvis.